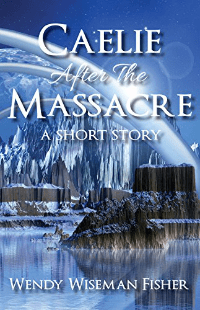 Caelie After The Massacre is a snapshot short story weighing in at a very light 13 pages. It feels somewhat out of context and it is a world full of unfamiliar creatures and tribal rivalries. We know that Caelie’s family is rich and powerful and that she loses everything that could tie her to their name and maintain their affluence and authority when she makes her way back to her slice of an alternate universe. Caelie is as well structured as a character running from death can be. We learn a little about her in offhand bursts. She’s collateral damage. Caelie is a daughter and seemingly inconsequential but the bad guys that want her whole family wiped out, so she must be killed. Tracked down and suffering from hypothermia, she’s sure not to last long, but the bad guys are through. Their win must be total and must be evidenced to a greater populace (either their people or people they want to threaten). We also know that Caelie, when backed into a corner, is not one to be messed with, but this is not a short story without peril. Will our eponymous heroine survive to the end of the story? There are no assurances or a clear picture of the series to come or if Caelie will play a role. Fisher’s hints at the tribal structure of the world as well as the canine-like social structure of the fearsome Moosewolves are intriguing. Technically the piece is very well written. The author perfectly conveys a sense of urgency and her characters react in a way consistent with the danger they face. The tone is dark and the hints of a greater alternate universe will tantalize readers of fantasy. There’s a lot left, seemingly intentionally, unclear which, for this reader, was a bit of a letdown, but I can see how people will become invested and the fans of this world will build. Fisher is a good writer with a solid imagination and authors with those virtues build a following. Are you a fan of fantasy? Pick Caelie After The Massacre up today and let me know what you think. You can connect with Wendy Fisher on Goodreads, YouTube and Twitter @ChimericalSoup.